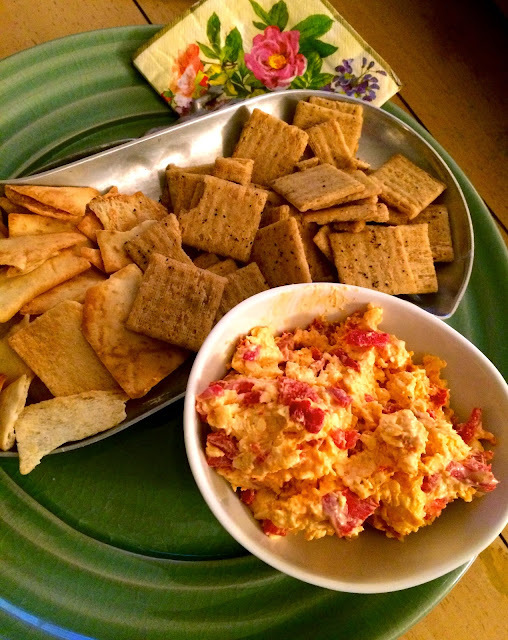 Pimento cheese is a southern staple and to me, a new-found delicacy. I was first introduced to the pleasantly rich cheese dip a few years back while visiting my now in-laws in Richmond. The blend of grated cheese, chopped pimiento peppers, and a little mayonnaise will add a touch of southern charm to any gathering. Some people add their own spin with ramps or pickles, but I like to keep my variation fairly simple with a solid kick. While my take may not be the most traditional approach, it’s approved by my Virginia-born husband and trusted critic. Paired with crackers or veggies, this is a quick and easy appetizer for any Memorial day potluck. In a large bowl, add the cream cheese and mayonnaise and combine with an electric mixer. Add the hot sauce, granulated sugar, cayenne pepper, paprika, large pinches of salt and pepper and blend further. With a wooden spoon, fold in the cheddar cheese. Fold in the chopped pimientos, cover with plastic wrap, and refrigerate for at least a few hours. Serve with crackers. Pimento cheese is also absolutely delicious spread atop a burger straight off the grill too!